Aviation Chicago Timeline is a chronology of aviation in Chicago starting with the first balloon ascension in 1855. The book examines Chicago’s key role as a center for exhibition flying, as the epicenter for U.S. air mail, and as a major aviation transportation hub for over a century. 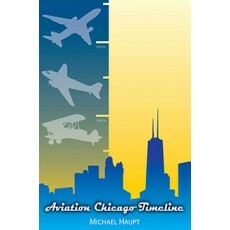 Aviation Chicago Timeline’s well-written text makes it suitable for the casual reader while its extensive notes and bibliography make it an essential reference tool.